by using the AARDWOLF Slab Rack Storage Calculator. Free download on Apple Store and Google Play. 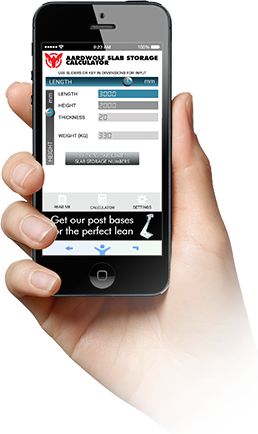 AARDWOLF – Slab Rack Storage Calculator enables you to determine the height and type of post best suited for your storage requirements. Accessible anywhere and at all times AARDWOLF Slab Rack Storage Calculator allows you to calculate the number of slabs that can be safely stored per bay with just a few finger motions.